One of the most interesting places I visited on my trip to China in early June was the Song Zhuang Art District on the outskirts of Beijing. We were taken by our friend Liu Yan who kindly arranged for us to meet with Shao Qi, an art gallery director, and to visit the studios of artists, Liu Liguo and Chen Qing Qing. 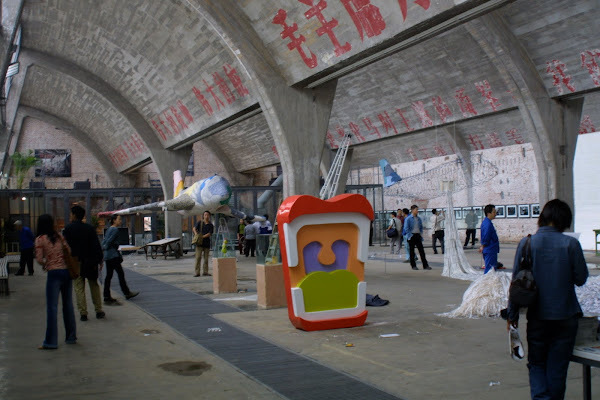 The first artists moved to Song Zhuang in the mid-1990s after the government pushed them from their neighborhoods in Beijing to make room for new development projects. Looking for a new place to work, the artists moved to a rural village that would be somewhat removed from the purview of the state. Since then the artists have turned Song Zhuang from a backwater to a thriving artist colony which now numbers around 4000, including international art stars like Fang Lijun and Yue Minjun as well as thousands of struggling and foreign artists. After driving for about 45 minutes away from the center of Beijing we arrived at what first appears to be a rather non-descript suburb with roads lined with small stores selling paint, pipes and vegetables. However, as our driving tour continued we were astounded to see a series of imposing, architecturally striking museums and galleries under construction. Those that were completed were mostly empty or closed. Equally anomalous was a massive sculpture created by Fang Lijun set in the middle of a round-about. At first it struck me as looking like an over-sized Hersey's Kiss. But, as Shao Qi explained, the different colored and textured layers represent the hierarchy of Chinese society with the wide thick base made of earth identified with the peasant class supporting six more ever-diminishing layers up to the golden pinnacle representing China's political and business elite - a wry commentary on the disparity of wealth and power in China today. Besides visiting the comfortable and well-appointed studios of Liu Liguo and Chen Qing Qing, we also stopped in to visit the condo of a middle-aged, amateur painter, and the wife of a wealthy businessman. Her current digs were modern and pleasant but temporary, and she was in the throes of designing and beginning construction on a brand-new, permanent home to be built on land leased from the local government. 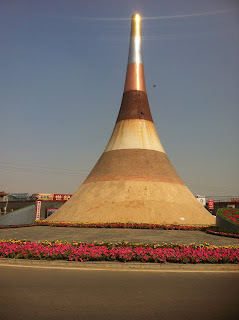 With China's newly affluent class taking up residence, the life-style of the majority of artists living and working in Song Zhuang is threatened by rising rents and plans by the government to develop Tongzhou, the district where Song Zhuang is located, into a commercial center by 2015.